1. Do not use harsh cleaning products or a wet mop. Instead, try boiling water and two teabags. 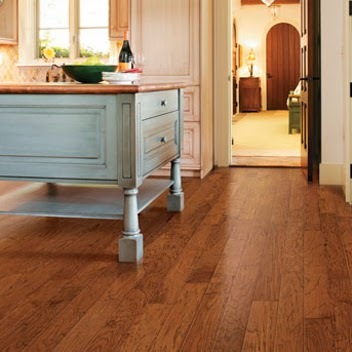 The tannic acid in tea creates a beautiful shine for hardwood floors. Let two teabags steep in a cup or two of boiling water for a few minutes. Pour the tea into a bucket. Take a soft cloth and wring it out in the tea - the cloth should not be dripping wet, just damp - and use the cloth to wipe the floor clean. 2. Have scratches in your hardwood floor? Try this trick: take a crayon the color of the floor and rub it on the scratch to fill the gap. Turn a blow dryer on high, heat the area where the crayon was applied and buff it with a soft cloth. Learn more about how to clean hardwood floors in our online hardwood care guide. Kermans is pleased to partner with HGTV to offer their popular HGTV Home Flooring by Shaw product line to Indianapolis. Whether you are looking for design tips or cleaning tips for your hardwood floor - HGTV is a wonderful resource. Stop by Kermans today and ask to see our HGTV Home Flooring by Shaw offerings. Not in conjunction with any other offer, see store for details. When you are shopping for hardwood floors, carpet, tile or area rugs - shop at Kermans. Our design experts will help you select the best floor for your budget. Stop by our showroom on the northside and see our hardwood floor selection for yourself. We think you’ll be pleasantly surprised that the service and quality you've always heard about comes with a price tag that is very affordable. That is the Kermans Advantage.